Frankly My Dear caught up with writer/director Danny Stack at world premiere of WHO KILLED NELSON NUTMEG? With 240 film screenings in 12 days, it takes a special kind of film to stand out from the crowd at the 2015 BFI London Film Festival. One film doing just that is live-action comedy family WHO KILLED NELSON NUTMEG? 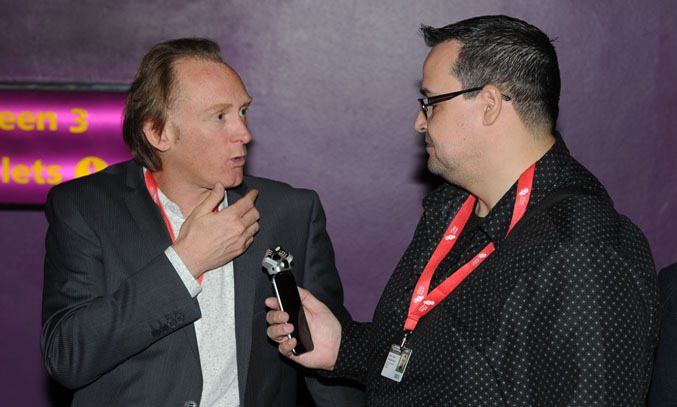 We caught up with co-writer/director Danny Stack at the world premiere of WHO KILLED NELSON NUTMEG? to find out what inspired him to make the film and to discuss the challenges of writing a film for children. Frankly My Dear (FMD): Hi Danny, congratulations on world premiere of WHO KILLED NELSON NUTMEG? Firstly, can you tell us a little bit about the film and what inspired you to make this particular project? Danny Stack: WHO KILLED NELSON NUTMEG? is a live-action family film about four kids on a summer camp holiday who think that the camp’s mascot, Nelson Nutmeg, has been killed so they set out to investigate. We put kids at the heart of the story because we really felt that was important. We wanted to see these kind of films back on the market again, where kids are in the lead roles. We were inspired by films from the Children’s Film Foundation days, and even Hollywood films like Goonies and Explorers, but for some reason they are not making films like that anymore, so we thought let’s do a kind of cheeky, low budget UK version of it but try and make it as fun and adventurous as we could. FMD: Where did the idea for the storyline come from? Danny: Well, the idea first was to make a family film with kids in it, then it was like what’s it going to be about? So we just spent a day brainstorming various ideas, like time travel or somebody’s Grandad’s house is haunted, all these types of normal, cliché things but then we focused on all of the benefits of where we lived in terms of Bournemouth and Dorset and said, OK we’ve got great locations down here, let’s set it along the Jurassic coastline and let’s make it a kind of classic murder mystery. So our film is like the Famous Five, meets the Goonies, meets Scooby Doo. We thought a combination of all that would work really well if we could pull it off and so far we seem to have. FMD: You co-directed this feature with Tim Clague, how did that partnership work? Danny: We like to say it’s like Cohen brothers style, but I think it was important on a low budget film like this as it enabled us to combine our resources and combine our time making the film so that we could get it done. We have been friends for a number of years so we decided let’s just do it for the feature, so we put our egos aside, there was no tantrums, there was no conflicts and it really worked, especially with the kids as we could spilt up and do different scenes at different times. I would encourage people to co-direct if they can find someone they get on with. FMD: I wanted to ask you about the cast. Obviously children are at the heart of production and I believe a lot of them are from the local area? Danny: They’re all from the local area in Dorset. A couple of them are quite experienced already, one of them has been in GAME OF THRONES for example, and another one has been in MR SLOANE which is a Sky Atlantic drama, but they’re all local. We cast for about four months before we got our key gang of kids and that was good fun because there is a lot of great talent around. We did some workshops to see who looked well together, who worked well together, so that was a long process. We also did a big open day casting and 300 kids turned up for one day. We had no idea if anybody would turn up and then 300 people were knocking on our door so that was fun and we found two of our main cast through that open casting day so it was well worth it. None of this felt like actual work, we’ve been doing it for a year and a half, but it’s all felt like such a good time, I would recommend it just for the good of anybody’s health just to make a family film. FMD: You are obviously an experienced scriptwriter. What are the challenges of writing a script for children in comparison to writing a script for adults? Danny: It’s interesting because I’ve written for prime time TV and adult films but for kids you have to be even more sophisticated in a way because they watch a lot of stories, they watch a lot of content so they know about structure and they can see the twists and turns coming. Plus you’ve got to be genuinely funny rather than trying to make clever references to things that nobody will get so that can be a challenge, but at the same time throw in a fart joke or a custard pie and you’re laughing. FMD: What future projects are in the pipeline for you? Danny: It’s a Christmas movie, it’s called WHO KIDNAPPED SANTA CHRISTMAS? where this local Santa Claus, who is a bit of Santa, a bit of Father Christmas, the best of both, he gets kidnapped so the kids try and find out who took him. It’s a sequel-of-sorts, same kind of film in terms of kids in the lead role but different characters. WHO KILLED NELSON NUTMEG? made its world premiere at the 59th BFI London Film Festival on 10 October 2015. Tags: BFI LFF 2015, BFI London Film Festival, Children’s Film Foundation, Danny Stack, Explorers, family film, Famous Five, frankly my dear, Game of Thrones, Goonies, MR SLOANE, Nelson Nutmeg, Scooby Doo, Tim Clague, WHO KIDNAPPED SANTA CHRISTMAS?, WHO KILLED NELSON NUTMEG?